On a whim and with a few extra bucks in my pocket I got some Spectraply turning blanks at my local Woodcraft a couple years ago. I made a candle holder and a bud vase out of some and the boss, er…wife, really liked it. So Christmas eve two years ago I made her an ice cream scoop with a spectraply handle. She loved it and we used is for about a year. She took it to one of our craft shows last season for a display and she ended up selling it. 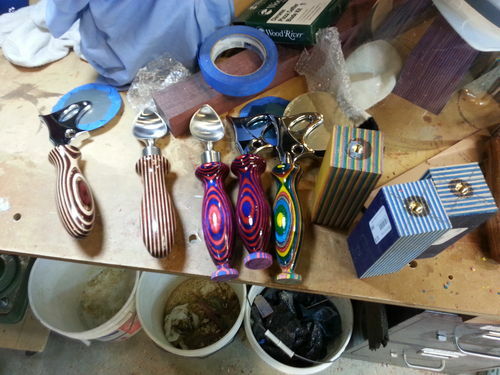 So she suggested I make a matching pizza cutter and ice cream scoop with spectraply handles. I did, and they sold on the first show I took them too. The Pizza Cutter unscrews from the handle so it can be cleaned in a dishwasher. I have modified the Ice Cream Scoops so they also unscrew from the handles. Ice Cream Scoop and Pizza Cutter from local Woodcraft store. Spectraply from local Woodcraft store. Polished on the Beall buff system. Comments, critiques, and suggestions welcome. Roger, thinking of you ice cream man. -- Pete, "It isn't broken, you just aren't using it right." Very cool work…. Well done. Very cool indeed! I love the colored handles. The Mrs. wants me to make some of these for our own use at home. Maybe I can squeeze these in soon. Thanks for the inspiration! I don’t have the process down to get as smooth a finish as the pen turners. But I work the small ridges down with the infamous BEALL BUFF system. And, I’m making more in the spectraply. BTW, I LOVED your dust collector post. Thnx Pete. Your finishes look fantastic. I had a pen that was from Red Palm wood, and I had 2 coats of CA on it as a finish. After completing it, I thought it was dry enough to put into a ziploc bag (not sealed tightly), but, it fogged up to a white milky look. I’ve gotta sand it all off and redo it. So, I don’t know what the heck happened. I guess it’s all experimental…...........more mental than anything..LOL OH, btw, I’m sad now that I sold an old lathe because I thought about setting it up with a buffing system…. oh well. Spectraply eh I am off to research where I can get some! The pizzacutter and scoop are brilliant! So do I understand correctly ? you polished the CA? I did, I did, I did polish the CA. On some of the handles the CA had too many ridges and valleys, So I had nothing to loose. I was careful doing it as CA is sensitive to heat, but it did knock off the ridges quite nicely.